As we transition from spring to summer, many of us are looking for light options for dinner. Here is a fresh, simple, healthy and delicious meal that is a breeze to prepare so we can enjoy the beautiful weather. Place a large pot of water on stove to boil and season water with a pinch of salt and little olive oil. Once the water boils add orzo. While orzo is cooking, trim asparagus and cut each stalk into three segments (you may also use this time to slice tomatoes and drain artichoke hearts). When orzo has 2 minutes left, add asparagus to the same boiling water. Once orzo and asparagus are ready, remove from pot and strain into a colander. Heat a large sauté pan coated with olive oil. Then preheat oven to 375 degrees. 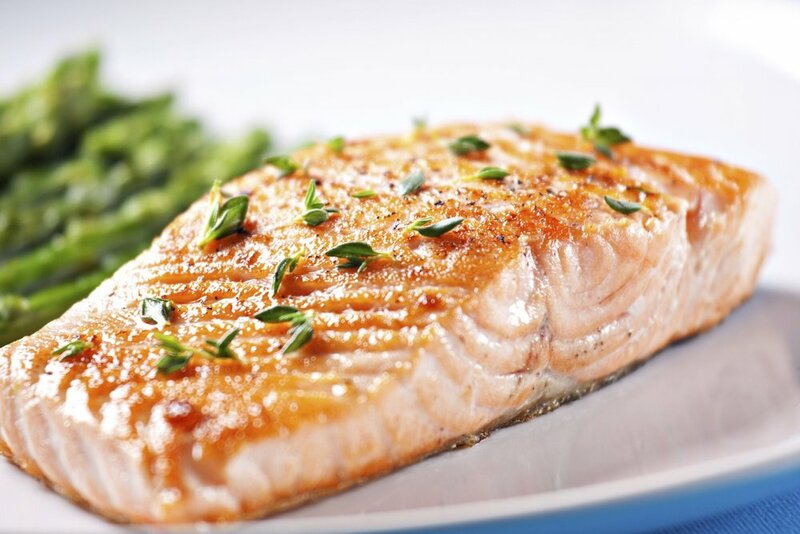 Once the oil is hot, the oil should have sheen to it and a slight amount of smoke rising, add the salmon filets, seasoned with salt and pepper and place the fish skin side down to the pan. Continue on the stove for four minutes and then add to oven to finish cooking. While the salmon is finishing, add a small amount of olive oil and minced garlic to a pan. Let soften slightly and add drained orzo, asparagus, artichoke hearts and tomatoes to pan. Add juice/zest of lemon and chopped leaves of parsley. Toss orzo to coat with all ingredients. Season with salt and pepper. Remove the salmon from the oven. Salmon should be slightly firm and light pink in center. Plate orzo in center of the plate and top with the filet of salmon skin side up to show the beautiful, crisp skin. Enjoy!